1. The Mama's Bicentennial Sampler (1976). Mother started this about the time she was first diagnosed with ovarian cancer. That could explain why she never finished it, although she made at least one other quilt before she passed away in 1979. It could also explain the quality of workmanship which was not up to her standards (or, I should say, my expectations of her standards). I was determined to get into quilting for the sole purpose of finishing that quilt, but it is still in the box. I can give a litany of reasons: It's 60% polyester, couldn't find the pattern, couldn't figure out what she was intending -- now I've run out of excuses. 38 years is long enough!! Even if I don't do anything more than assemble what she had finished. I discovered that I do have the pattern! It was in the box -- duh! It looks like she may have settled on just four blocks (see her numbers on the page). Or, knowing my mother, and judging from the amount of unused fabric, she may have been planning to make one for each or her three children. I'll never know, but it brings me closer to her just imagining what was going on in her head. Crazy patchwork on a muslin foundation was the only type of quilting I had done until 2000. Apparently I started this in the period between marriages. I embroidered the date on one of the blocks, as well as a B for Brian. I'm sure some of Noel's jeans made it into this, as well. I either gave away the rest of the jeans or ran out of what I had because I have 7 partially-done blocks. I think I'll make a trip to a thrift store to get enough for 12 blocks. The next three were on my previous list. I started SnC in a guild class with a teacher from Alabama (her name escapes me at the moment). I made the strata and cut a few of the blocks, but never got far into the overall design. So I took a class with Louisa Smith, creator of the SnC concept, in 2007. This is as far as I got. It's still rolled up on the noodle. A Jackie Robinson pattern that ends up in a woven ribbon effect. Apparently I never took a picture. I do recall that one of my fabrics was a poor choice, but I have since replaced it and even have several blocks together. It's one of those patterns that really demands an accurate 1/4" seam and I know I wasn't doing so well in that department when I started this, so it may be a struggle to finish. 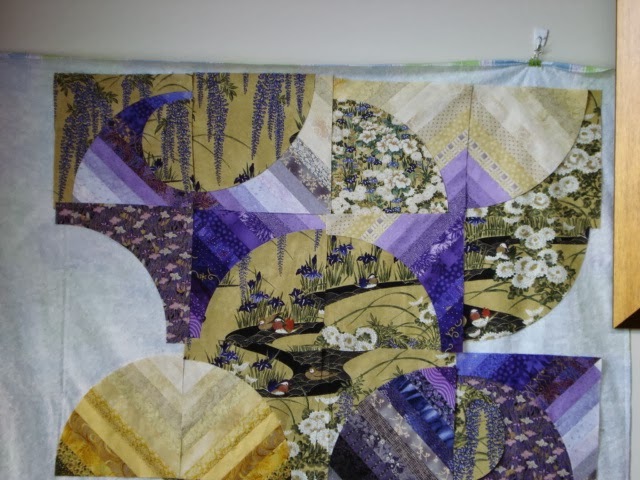 Linking up with Judy L at Patchwork Times for design wall Monday. First, the stash update. I'm out of the hole, over the edge!! How did I accomplish that? I finished Dusk to Dawn flimsy and made the back for a total of 4.25 yards. I finished assembling Starstruck, added borders, and made the binding for another 4.25 yards. I'll admit that I added 3 yards for the borders after I decided to make this a gift for a special person. In addition, I donated 2 yards for a quick comfort quilt. We had a lovely group of 18 ladies for some or all of the week. Two in the group were nuts for dolls. Their tiny charges kept a close watch on the proceedings. Now you can understand why I'm always inspired with this group! Winter is coming back next week, so keep warm and quilt on. That's what we call this gathering -- Nuts and Bolts. You can bet we've got some of each. First, a status update on my plans. 1. Cruise Quilt - trimmed it but decided the trimmings from the back were not appropriate for the binding. I think I have more of the border fabric at home, or at least something close. Packed that one away. 2. Dusk to Dawn - added inner and outer borders and made the back. Still need to make binding, but went ahead and packed that one away. It will remain a flimsy till I need it for something. 3. Starstruck - Turns out I had enough blocks made and it didn't take long to get the center together. When I decided that it would make a better gift than a charity quilt, I sent an emissary to Whittle's (I didn't want the temptation) to pick up nicer fabrics for the borders. The top is finished and binding made. I'll use something at home for the back. 4. Stars of Summer - made a sample block and decided the stars will be too dark with the fabrics I planned to use. Plus I discovered that, in a fit of efficiency, I had left the remaining background fabric at home. STYMIED! Back in the box. 6. Celtic Solstice. After analyzing what was in the two boxes, I determined that the reason I got bogged down was the fact I had run out of the blue corner fabric I was using on Birthday Girl blocks and I also need a few better looking chevrons, as well. In all I am short 4 BG blocks. They will go in the corners. Just 7 blocks away from putting the center together. And I still have binding to do while watching skating tonight. All is well with the world. Except that I'm not sure I can upload photos on this new travelling gizmo MM (Main Man) gave me/us for Valentine's Day. ... to a retreat in Kentucky. Looking forward to accomplishing a lot during the week and soaking up all the creativity generated by everyone. I never cease to be amazed at the talents of my friends and what I can learn just by being in the same room with them. 2. Add inner and outer borders to "Dusk to Dawn." Make back and file for quilting. 3. Finish Star Struck -- lay out remaining rows, sew together, add border(s). Make back and file for quilting. 4. Having finished two UFOs, I can then proceed with a clear conscience to start something new. I have pulled Stars of Summer off the shelf. It won't get finished this week, but I'm hoping to make some good progress on it. I plan to use printed panels as the star centers. Strips are cut and I'm looking forward to working on something new. 5. In between all this, my leader-ender project will be making the 9-patches for Jack's Chain. The strips are all sewn; just need to cut the 1-1/2" chunks before I can start sewing. 6. I'm also taking along Celtic Solstice. I believe I have all the units made and if I can just finish the Birthday Girl blocks at this outing, I will feel like I've accomplished something. Not wanting to miss the Olympics, I hope to do some hand stitching on bindings in the evenings (that is if the TV in the lounge is working). I'll report in on my progress next weekend, if not before (assuming the WiFi is working). Weather will be a lot warmer next week, thank goodness. Hope it's the same for everyone else. Hop over to Patchwork Times to see what's on design walls around the world. First, my weekly report: Nothing in, nothing out still near even on stash use. That's worth a Whoop Whoop for sure. On Friday I was whooping it up Big Time! Take a look at what I picked up from Susan, my longarm quilter. In 2007 DH and I took a fall quilting cruise From NYC up the northeast coast, around Nova Scotia, and down the St. Lawrence to Montreal. In advance of the trip I received a square of fall leaf fabric with the challenge to make a block to commemorate the trip. I entered my block in the competition and guess what. My block WON!! on the leaves to give them dimension. The judges, which included Alex Anderson, Joen Wolfram, and Laura Nownes, commented on my overall workmanship. Oh, My! I used Debbie Bowles pattern BQ (for Big Quilt) which is perfect for setting an assortment of disparate blocks. The top was finished in January 2012; I don't know why I waited so long to get it quilted. Look at what a great custom quilting job Susan did. Linking up with Sarah at Confessions of a Fabric Addict for Whoop Whoop Friday and Judy at Patchwork Times for the Sunday stash report. Warming up here, but still quilting on. One quilting Friend found herself "homeless" when her daughter and SIL decided to move to better accommodate their growing family. No room for Grandma. She was considering an "adult" development near daughter's new house. I suggested she contact another quilting Friend who lives in that complex so that she could see what the condos looked like inside and to see if Friend 2 knew of any units available. Unknown to me at the time, Friend 2 is moving to NC with her daughter and SIL. She sold her condo to Friend 1 without ever having to list it for sale! And, furthermore, she is leaving her design wall, peg board and bookcases in the sewing room!! Win-Win all around. I'm so happy for both of them. First class went well at guild yesterday. I was also able to fill two more slots in our 4th Saturday Sit 'n' Sew programs. It's going to be a good year! Sun is shining - don't be fooled, though; it's *&% cold out there. I need to get valentine packages in the mail today. And finish pattern instructions for Irish Grandmother. Have you been watching the Olympics? Have you noticed the patchwork motifs in the sideboards at the skating rink and on the skiers' bibs? And on the US snowboard team jackets? I especially love their bright, fresh colors. Anyway, it's a serious thought. Meanwhile, take a look at this mess. I spent Sunday morning trying to pick fabrics for Summer Solstice by Judy Neimeyer. I had hoped to use a gorgeous batik my son and DIL brought from Hawaii, but I finally decided that it was limiting my choices -- which sounds impossible as I think about it now because it contained every color in the rainbow. I went through pinks, greens, purples, and oranges before settling on this grey/gold fabric as my inspiration. I still need to come up with an accent color to use in the Lemoyne star center. I am determined to use nothing but stash. Since I have five classes coming up in March, I need to get myself organized. Summer Solstice is first at Peg Bingham's Spring Training Camp in West Virginia. I go directly from there to Pigeon Forge for Mountain Quilt Fest where I have classes with Jan Krentz (Variable Hunter's Star), Bonnie Hunter (Smith Mountain Morning), Karen Kay Buckley (border design), and Bonnie Goolsby (Jack's Chain). I started Jack's Chain a couple of years ago, but I'm clueless about how to put it together. I hope Bonnie Goolsby has some good tips! Karen Kay Buckley's class is just design, no prep there except getting my tools together. I've started cutting Smith Mountain Morning. The Variable Hunter's Star is going to require about as much thought as Solstice. Again, I'm determined to make it from stash. All of this means that if I am starting four new projects, I'll need to finish eight first!!! Wait, wait .... technically, I can count Jack's Chain and SM Morning as UFOs since I started them before the first of the year. LOL! But first, today is guild Monday. I've been putting together a series of back-to-basics lessons for this year's program meetings. We're using McCall's Quick Quilts "Studio Sampler" series as our "text". At the end of the year they will have enough blocks to make a quilt. I believe many new quilters started right in with specialty rulers and catchy gadgets; they have no clue how to analyze a picture and create a quilt without a pattern. I'm on a quest to change that! I had a productive week. On Monday I used 8 yards for backs on two quilts that will be going to the quilter soon -- Rock Island Campfires and Irish Grandmother. Kinda looks like I'm in my "Black Period," doesn't it. I will be teaching Irish Gran at my guild (my Beta Test Group) in May and at Peg Bingham's Quilt Camp in October. This week I'll be working on another class sample using Ohio State's scarlet and gray color scheme. Then it will be time to finish writing the pattern instructions. And another 10 yards went into Cathedral Stars!! Only took 3 years, but considering I have many UFOs older that that, I don't feel too bad. I'll be taking another Bonnie Hunter class at Pigeon Forge in March, so I wanted to have it ready to show her. Besides being almost even on stash inventory, I am now even on my 2014 goal of finishing two before starting one. I have two UFOs in line to finish at retreat next week and I'm thinking about which of my "TODO" projects to take, as well. First, a Friday Finish to announce: Cathedral Stars, started in a Bonnie Hunter class in March 2011, is to the flimsy stage!! I don't have a space to display it laid out (and my bed is too messy to photograph today). Here it is before the borders. I posted tips for doing borders here. Girl, am I glad I used that technique because my math said one thing and the quilt was an inch larger, but only in one dimension, even though it's supposed to be a square quilt. Now, I have a question for you. What is this?? You can see the dimensions from my scruffy cutting mat. Here's two more shots from top and side. It showed up during my cleaning frenzy after finishing two tops in the last two weeks. I think I got it, as is, in a grab bag of quilty stuff several years ago. It's obviously missing some pieces and parts. I checked the June Tailor website and it's no longer offered. I'm guessing it's a notion for hand sewing and this is how I'm using it.